Lately, the feminist activities that took place in Egypt have forced me to come up with a politically incorrect, yet frightfully accurate definition for feminists. Feminists are victims looking to victimize any possible female and to vilify every possible man in the hope of some sort of empowerment. "Because thou art a miracle of deafness. It is not that thou art stupid. Thou art simply deaf. One who is deaf cannot hear music. Neither can he hear the radio. So he might say, never having heard them, that such things do not exist." What if you had the most interesting and intruiging book in the world, but you knew the day you finish reading it would be the day you die, what would you do? He was sitting in a bar sipping wine together with his ex girlfriend and her girlfriend along with some others. The three of them were drinking wine and enjoying the cheesy music that the bar was playing. It was obvious that the ex girlfriend and her friend were getting along fine despite how different they were. He was trying to find peace with the whole situation. At one point in the evening he leaned over to the friend and stated, "You do know that we broke up because of you, don't you?" "Yes, I know," she said with smug smile and a sense of self satisfaction. The feeling he felt was indescribable, but he decided that he wouldn't waste another minute of his life feeling that way. With this decision he had some clarity, he left his share of the bill and more on the table, and left. I must have written those same thoughts a thousand times but every once in a while they get to me in different ways. I'm basically very disappointed in liberals. Why am I not disappointed in conservatives you might ask, it's because their name makes no promises. They are conservative and their thinking is implied to be conservative and somehow that implies limited. I'm disappointed in liberals because of their deceiving name. Liberal unfortunately implies liberal thinking and liberal views. They deliver on some of the views but when it comes to thinking most are limited. The trouble is that a liberal doesn't always have a liberated mind. There's no big difference between liberals and conservatives in how dogmatic they are. Liberal does not mean open minded although it implies it. Liberal and conservative are adjectives describing views rather than thinking. Unfortunately neither side practically means an open mind capable of thinking matters out fairly. The vigor with which liberals hold on to their views is appalling and disappointing. If anything they stand for more freedom of expression and more rights, and yet the amount of dogmatic stances that give no other voice a chance are in contradiction of what they stand for. It's far worse to be a liberal with conservative thinking than it is to be a conservative with liberal thinking. The true gauge is how much your mind and your thinking is liberated rather than the views you've concluded. At first, with the flexibility of thought that comes with a young age, there is room to hear both sides and understand what they're all about and take decisions. The ability to listen is something of value. I never thought I would say this, but I've found a use for ignorance. The real use of ignorance is the ability to listen. Ignorance gives people tolerance. They have to tolerate others because they don't know better. But why stop at liberals and conservatives, that's just the nature of people. When they're young they're flexible and open for ideas, and as they grow older they grow more and more rigid. They stop believing in change and rightly so, for the inflexibility alone is enough. All there is to be heard has already been heard, so why waste time? It's hard to express, but what I mean to say is that more ground is covered the older we grow and the more wise we appear in our own eyes. It is never about us not understanding things clearly, it's about us understanding it and rejecting it, no matter what blind spots. But there's something else to do with ignorance, and not ignorance of facts. I said that ignorance breeds a sort of tolerance and it counts most when you're ignorant of people. When you don't know someone, you don't bother to stop them from whatever crap they're saying, you listen and maybe you justify it by virtue of politeness. When you get to know people better the tolerance ends. You can no longer tolerate certain views or even bear to hear them out as a sort of self expression from the teller; more than that you have the power to disrespect them, interrupt them and shut them down. We're far often more courteous to strangers than we are to close ones. It's as if when we first know people we're like children, and as we know them more we grow older and along with the increase of age a decrease of tolerance. Views are liberal and conservative but thinking isn't. Thinking might be the ability to throw all you've thought about far behind you and be willing to reconsider things. When you have the patience to reach a conclusion similar to where you're at now, then that's tolerance; if you reach a different conclusion, that's open mindedness. A little bit of ignorance would help specially with the people you know. A little less taking for granted and allowing them at least the courtesy you allow a stranger. One of the perks of working with mundane computers is that they give some of life's most valuable lessons. No matter how perfectly you think your approach is or how well you've covered all the angles, there's always a new perspective, always a new approach that's, in all likelihood, better. Sometimes you encounter people saying something that seems naive to you, but upon further inspection you realize that they're actually one step ahead of you. Of course all these computer lessons apply to the computer world where actual thinking occurs, but when it comes to people it might not apply. After all everyone's just voicing out an adopted opinion that can be dogmatic and have no basis of thought, but you just never know when you'll hear a genuinely intelligent comment that might alter your perspective and better your approach. 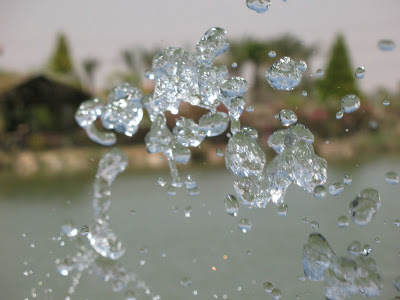 Up close, even the water particles are disconnected and take various forms. Non Spoiler warning, if you’re looking for a review that tells you what the heck is going on, then you’re not getting it, this is just my reaction to the movie with some observations. Babel is following the now known mould of movies like Crash, Magnolia and Three Seasons, many characters interconnected and their story slowly unraveling. ‘Slowly’ is a keyword when it comes to Babel. It is a very good story, that’s been told well with all the tools that cinema has to offer, but perhaps its length was an issue. With movies like Crash, Magnolia and Babel, there’s always the dilemma of keeping things short or making them long. When they’re short, you feel you haven’t spent enough time with the characters and that all aspects haven’t been covered, like Crash. When it’s long, it tends to give you more of the characters but it drags, like Magnolia. Babel, was more like Magnolia. There’s always the problem of keeping the user as interested in the different characters who are all taking major roles, and the switch of story and scene sometimes turns off the hypnosis. In Babel however, I can assert that the scenes were all well made and interesting, though not necessarily pleasing to all tastes. Director Alejandro González Iñárritu did a great job with 21 grams by cutting it up to pieces that took a bit of time to put together, 21 grams while being a great story, if ordered would be a long dragging tale that would have been harder to follow, if that’s possible. He made the mistake of putting things more together in Babel. The movie still happens in different timelines, but it’s more comprehensible and slightly more predictive since the timeline is not that extended. That’s not to say that Babel is not a good movie, it tells a particular story very well. The scenes seem to have been made patiently and a lot of work has gone into making every shot special. The music is non invasive and brings across the right feelings for the scenes and the moods. There are so many cultures brought to the screen and they come across as genuine. The stories are reflective of the cultures they represent, the despair and triumph for Americans, sorrow and depression for the Japs, oppression and death for the Arabs and fleeing and undermining for the Mexicans. The problem isn’t that the story isn’t told well, but that the story was overtold. Despite great scenes, it seems as if the director wanted us to wait for his story to unfold and instead of adding more events, he stuffed it with artistic scenes that shifted the focus from the main areas of concern. Independently the scenes are great, but they hinder an already slowly moving rhythm. It seems that there is a trend of telling more than one story of one person. In books about writing books it’s always advised against writing with a God view. But it seems that these days the story of one person isn’t enough, people are more concerned with the big picture. Books and movies alike are turning towards telling more stories about more people, such as Alaa El Aswany who keeps taking us from character to character and movies such as these. I’m not sure if people are now concerning themselves with the ‘greater’ good where greater refers to a greater number of people, or if their intellect has absorbed all kinds of singular stories that they’re looking for more brain food through a multitude of stories rather than one. Babel is well made and has some very compelling scenes. At the very start it looks like a foreign movie (as opposed to American) because of the focus is on characters that are stereotyped usually and are of no concern to Americans, and it does well to combine that authenticity with the more modern scenes in Japan. If you’ve seen the movie, you don’t need to read this and if you haven’t, you probably haven’t understood what I’m going on about, I should have included this in the warning. That's all I have to say really... Life is counterintuitive. The more humans learn about the world, the more they realize that their intuition is wrong, I'm just wondering if our intuition will ever change to suit the practical demands of life. I say this because it's counterintuitive to waste time planning while you can actually be doing the job, but this waste is what people have found to be productive. It may be intuitive to flourish at the expense of all others, but advanced countries show us that the good of the community can make you flourish even more. It may be intuitive to do the manual labour straight away, instead people spend years developing machines to do tasks rather than working on the tasks themselves.